"These are the best I've had, short of the actual grilling method of course! This is a very simple recipe that I came up with a few years ago. It's not rocket science, just ribs cooked in the slow cooker and finished in the oven. This is what I do when I want ribs during the week and have to work all day. I'm eating them within a half-hour of getting home, and they turn out perfect every time!" Pour water into slow cooker. Layer the ribs into the slow cooker. Top the ribs with onion and garlic. Transfer ribs to a baking sheet. Discard onion and garlic. Coat ribs with barbeque sauce. Bake in preheated oven until the sauce caramelizes and sticks to the meat, 10 to 15 minutes. Not bad, but the rib meat didn't have much flavor. If I try it again, I think I would marinate the meat overnight, and use a can of beer instead of water, to add more flavor. These ribs were really good- I was surprised as the recipe was very simple and didn't take much time. My whole family really enjoyed these! Marinade the night before with red wine vinegar, soy sauce, Worcestershire sauce, black pepper, olive oil, minced garlic and Dijon mustard. Then follow recipe as is. 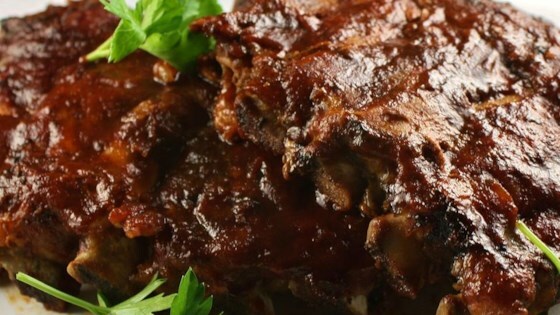 I have recently tried several BBQ rib recipes and this is the best one yet. I made it exactly the way the recipe was written and they were falling off the bone delicious! !